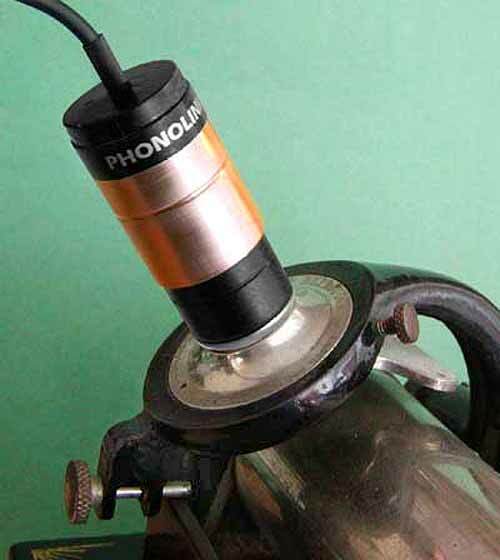 The Phonolink is a dynamic microphone that plugs in where the horn of the phonograph normally goes. It will fit Edison phonographs with B, C, D and K reproducers - and some other reproducers as well. The diaphragm and stylus assembly in the original reproducer are still in place and working - and inevitably adding some colour to the sound. The microphone in effect listens to the vibrating diaphragm through the small chamber of air inside the reproducer. As this plug-in is not in direct contact with the cylinder, fitting it to the player is not a really critical operation. Ideally, the fit should be airtight, but some leakage can probably be tolerated. What you will need, though, is a phonograph that works well, with a mandrel that turns at the right speed without variation or noise, a supple diaphragm on a healthy gasket, and a stylus in good shape. You will be able to listen to all the types of cylinders your phonograph will play. Jeff Link, the manufacturer of Phonolink, recommends that it be connected to the microphone input of an amplifier or whatever other device you may be using. If, for some reason, you would like to listen to your cylinders through the phonograph's horn, the Phonolink can be easily unplugged, leaving its place to the horn. 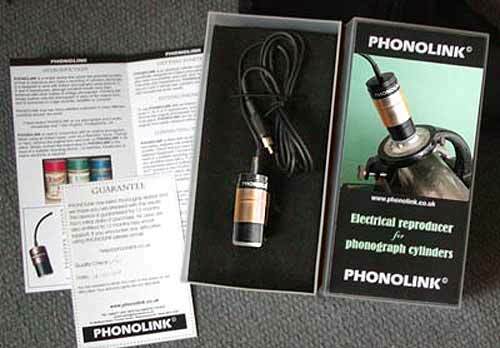 The Phonolink as delivered, with its box and instructions leaflet.